iPhone’s Numbers comes with 30 templates and one blank, and these are the same templates as in the Mac version of Numbers. Templates make it really easy to create a new document and just type in your data and substitute the placeholder text with your own. Even if you don’t use a template, looking at them gives you a good idea of the power of Numbers — granted, if you want to get fancy, you probably want to create your spreadsheet on an iPad or a Mac and use your iPhone to access your data, make minor corrections, or project it on a computer or monitor. Tap Numbers on Home screen. When Numbers is turned on in iCloud, you can share the spreadsheet after it’s created. Tap Create New (it’s the first icon on the top left with the plus sign on it). If you already save Numbers spreadsheets to iCloud from another device or Mac, you see them here and can tap to open them. Likewise if you saved Excel documents in Numbers on your Mac; they have an “E” on them in the Numbers chooser until you open them and then you see a preview on the icon on the Numbers screen. A sheet, named … drumroll please … Sheet 1, is created and contains one blank table. In addition to the 30 templates that come with Number, you also find free and fee-based template apps in the App Store. Tap the value button (42) to enter a number value. Tap the button on either side of the keypad to assign a value type, such as dollar or percent. Tap the star to create a ratings box or the check to create a check box. Tap the clock to enter a date or time. Tap the calendar or hourglass by the keypad to switch between months and numbers. Tap the text button (T) to enter text. Tap the formula button (=) to enter a formula. You can see the formula in the field at the top of the screen. To use a cell to create a formula, tap the cell and it appears in the field. Tap the operator you want to use and then tap another cell or a number. You see the formula for cell C3 equals B3 + 30 percent. Tap the check mark on the right end of the field when you finish entering the value, date, text, or formula you want. An easier way to enter a formula is to use Numbers’ functions. Tap the function key (next to the SUM key) to open the list of function categories. Tap Categories at the bottom of the screen if it isn’t selected, and then tap a category from the list. 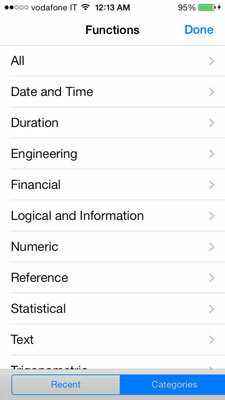 A list of functions in that category opens, and you can tap each function to read a definition of the function, how it operates, as well as an example of how it’s used. Tap the category name in the upper left corner to return to the function list and then tap the function you want to use. It’s pasted into the cell you had selected. All keyboards have a delete button. The value, clock, and formula keyboards have tab buttons, which move the cursor on cell to the right, and return buttons, which move the cursor to the beginning of the next line, whereas the text keyboard only has a Next button, which moves down one cell. The formula keyboard has a clock and text (“A”) button, which switches to those keyboards to you can insert those types of variables in your formulas; tapping Done takes you back to the formula keyboard. The formula keyboard also has a symbol shift key, which toggles between different mathematical symbols to give you more choices, much like the numbers and globe keys on the text keyboard toggle between different keyboard layouts and languages. Tap the Add Column button in the upper right corner of the sheet to add a column or the Add Row button in the lower left corner of the sheet to add a row. 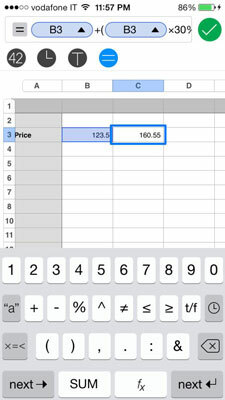 Tap the Add Sheet button (the plus sign next to the left of the Sheet 1 tab) to add another sheet to the spreadsheet. Double-tap the name of a sheet to select it and type a more descriptive name.